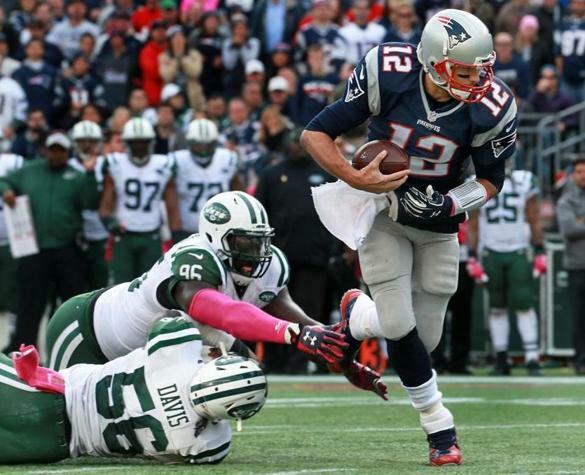 So is the Jets D the best in the NFL in years, or is Brady just having an off day? Yet somehow, New England still scored 30 points and beat a previously 4-1 team by a touchdown as Brady went 14-for-17 for 150 yards and two TDs in the fourth quarter. Even though Brady (and his slippery-fingered receivers) didn't play that well, he still finished with 355 yards passing because he threw the ball 55 times. The Patriots ran a total of 64 plays on offense with only nine rushing attempts--tying an NFL record for the fewest ever in a victory. Four of those attempts were by Brady, who's 15 yards on the ground made him New England's leading runner for the first time in his career.